All eyes were squarely on Louis Vuitton though – Abloh’s first autumn/winter show since becoming artistic director last year. Images on Instagram suggested a Michael Jackson homage, but this proved a red herring. Yes, the invitation arrived on a single white glove and his music played as the audience entered the Tuileries Garden on Thursday morning, but the reality was more of a quiet tribute – a triple-zip jacket as worn in the video for Beat It, here. A plissé shendyt skirt as worn in Remember the Time, there. Nothing more than that. Instead, the collection told the story of a black boy growing up in the mid-century US who, against all odds, became an icon through music, dance, and “an ordinary wardrobe comprised of staples … that became extraordinary”, which is perhaps a guide to how Abloh, 38, views his own ascent from outsider (rather DJ/producer/Kanye collaborator) to one of the most powerful menswear designers in the world. Jackson’s story played out in the clothes chronologically, opening with four grey zoot suits from the 1950s, and finishing with plissé skirts silk-printed in a riot of colourful flags. In between there was oversized quilted outerwear in gentle tones of grey and black, and lots of gloves. Colour came in cycles – silk-satin pyjamas in purple, gabardine hoodies in taupe, and red military shirts in cotton-satin – before exploding into the whole spectrum for the final three looks. 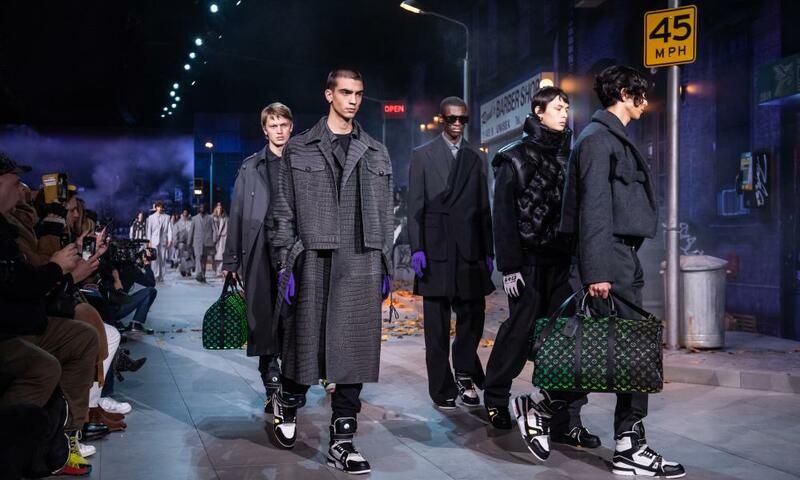 With sales largely driven by leather goods (accounting for 25% of all LVMH group sales) the bags came thick and fast too, and included enormous backpacks, neon wallet bags, and a handful of Vuitton monogrammed trunks for the original fans. Naturally, the models wore trainers. The set was designed to rival a Broadway production. Guests sat on stoops in front of a perfect recreation of a New York street, complete with dustbins, road signs, mattresses and crisp autumn leaves. They were treated to a live performance by the musician Blood Orange, and a solo sax performance that evoked 1990s New York. The front row too, which included Timothée Chalamet, Frank Ocean, Joel Edgerton and Naomi Campbell, was reliably starry. It was part fashion show, part performance piece. Even the models walked in a snake instead of a line, while the model and dancer Alton Mason performed backflips in a purple silk-satin pyjama suit. As ever, Abloh left the analysis to the show notes. This season like last, he provided an A-Z glossary of terms and references to guide the guests through the collection. These ranged from the technical (denim, plaid, plissé) to the gnomic (sleeve-longation, compressomorphosis and Jamiroquai). There was, perhaps, too much to say. It was a world away from his Off-White show, which took place beneath the Louvre the day before. Here the theme was publicbroadcast, and the show a lesson in fashion as entertainment. The set was a brutalist ruin within a garden, designed for the live stream, and the clothes were elevated skater chic. 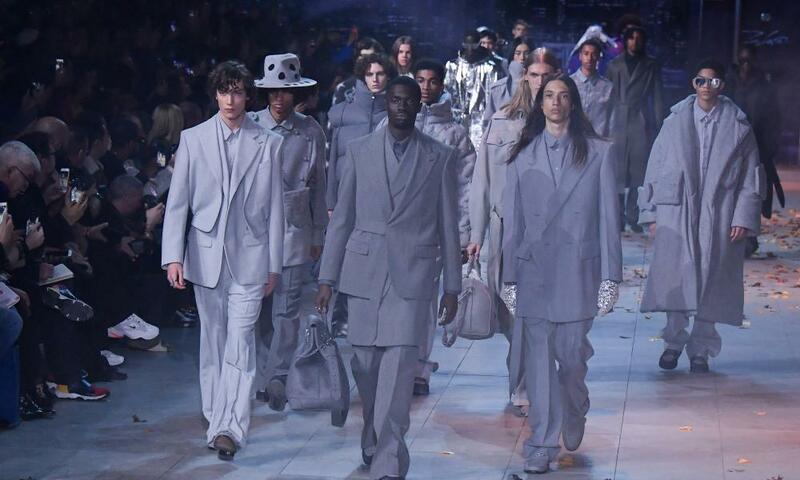 If all the figuratively adult themes have, as people say, gone into Vuitton, this was one for his millennial fans. The room even smelled of vape. 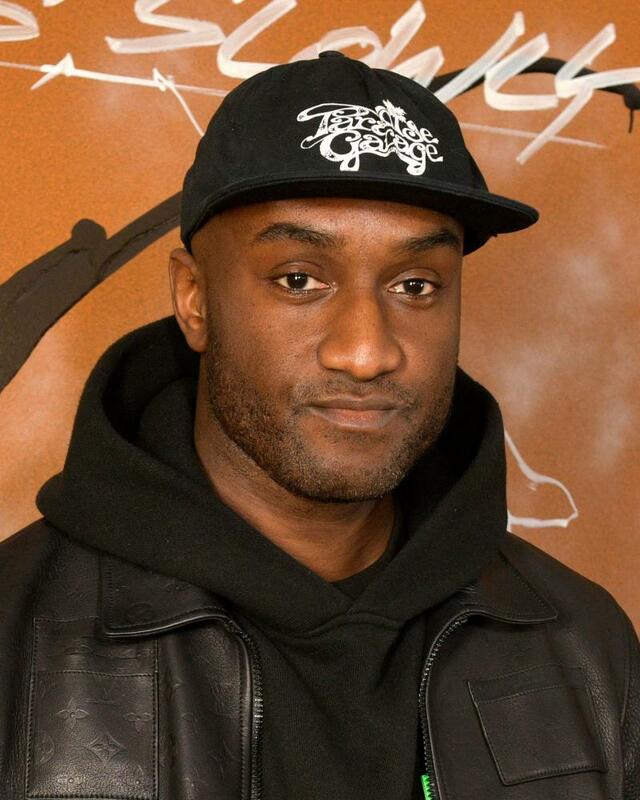 Compartmentalisation between the two labels has been a vital part of Abloh’s success. And it has been successful – his first Vuitton collection is selling 30% faster than the much-hyped collaboration with Supreme from 2017. And his success goes across the board – first-quarter revenues at parent group LVMH, reported in April, showed revenues had grown 13% to €10.85bn (£9.5bn) thanks to a strong performance by Louis Vuitton. 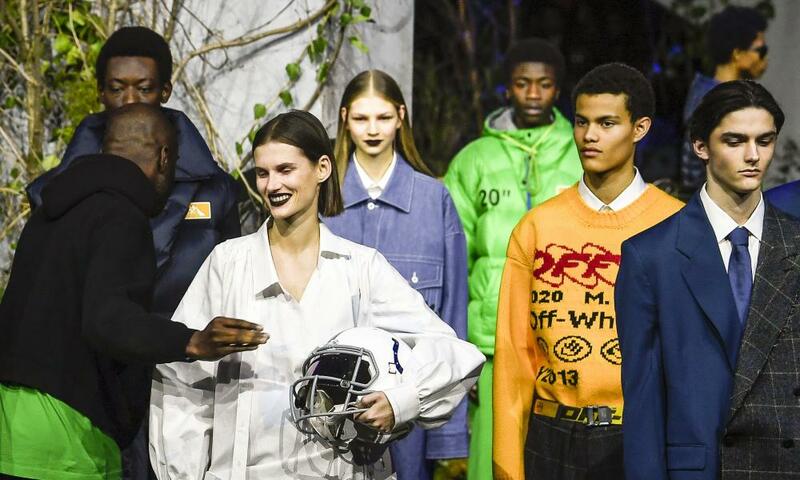 If menswear, an ever-growing market, is no longer fashion’s secondary consideration perhaps at some point Abloh will no longer be seen as an outlier either.